New York : Random House, c2003. 270 p. ; 22 cm. In the year 241, twelve-year-old Lina trades jobs on Assignment Day to be a Messenger to run to new places in her decaying but beloved city, perhaps even to glimpse Unknown Regions. 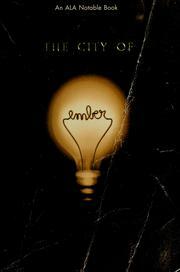 The city of Ember / Jeanne DuPrau. Reading Counts 5.1 15 Test #Q33867, Available. AR MG 5.0 9 Test #69274 BGMS. 100 ME:PersonalName 1 $a Personal name DuPrau, Jeanne. $c Statement of responsibility Jeanne DuPrau. 520 Summary $a Summary, etc. note In the year 241, twelve-year-old Lina trades jobs on Assignment Day to be a Messenger to run to new places in her decaying but beloved city, perhaps even to glimpse Unknown Regions. $z Public note Test #Q33867, Available. 650 Subj:Topic 8 $a Topical term Fantasy.